ORIGINAL 2:26 PM REPORT: Live right now at seattlechannel.org – the Seattle City Council is meeting, with the latest version of the annexation resolution on the agenda. This one (see the full text here) would put the council on record as saying they will make a decision whether to proceed with a North Highline annexation vote by the end of February next year, or will withdraw their interest in the area. The resolution is fairly high on the agenda (which you can see here). When introduced, as reported here, the Regional Development and Sustainability committee passed it 2-1 (the no vote was Councilmember Jean Godden). 3:18 PM: The council has just voted to pass the resolution as amended: They say they will make a final decision by the end of next February on whether Seattle would seek an annexation vote – but with a BIG change: If Burien wants to pursue annexation in the meantime, they won’t object or get in their way. More to come. 8:11 PM: City Manager Mike Martin just briefed Burien councilmembers on this afternoon’s Seattle developments – no additional information; he summarized the move as, “They came just short of encouraging the city of Burien to annex” the rest of North Highline. Councilmembers had no questions; Mayor Joan McGilton said she had seen the news right here on WCN (which as of this writing, is the only neighborhood-news website with coverage). No hint at future action or what’s next; we’ll be following up. You’ll be able to find the archived meeting video on that same link featured above, once it’s over. I am not surprised by the decision of the SCC to slide this issue to the bottom of the pile for nearly 1 more year. Since the late 90’s the White Center community has been asking the City of Seattle about what they could bring and provide to our community. Over and over again the response has been “we need more time”. Staying true to form the saga continues. If we were ever annexed by Seattle can you imagine how long it would take to get anything to improve our neighborhood? Most of us would not live long enough to see the results. Much like the Arbor Heights residents wanting sidewalks and improved fire responses into their neighborhood. At least Burien established the area they could annex first and they did it. I look forward to the day when annexing to the City of Burien will be on my ballot. I suspect it won’t take anywhere near the amount of time that Seattle has been stringing us along. Arbor Heights residents could use improved fire response times,… much like all of North Highline and Burien could use much improved staffing, efficiency, ladder trucks, and specialty services. The shame is that you can’t see how a city that actually provides services needs to make sure it can provide them before doing so. Its much easier for a “city” that does not provide services…and instead contracts them out i.e. Burien which does not have a fire department, police department, water department ect…to provide them. If a city really doesn’t provide much….it’s easier for them to say ok. I hope Burien comes through, though something tells me they don’t want us Rat City residents. “Something tells me” that by the end of 2012 you will be a resident of Burien. There is a solid majority on the Burien City Council for putting annexation on the ballot, whether you think so or not, and my guess, for whatever that is worth, is that North Highline residents, who by the time of the election will be just plain sick and tired of being jacked around by Seattle again and again and again, will vote to annex to Burien. I used to live in the unincorporated area this article speaks of and that was almost 7 years ago. This matter is still going on!?!? It was recommended back then to annex to Burien and get better services by doing so. Seattle is way too big to care about those still out in limbo. I hope the people vote to annex into Burien. Seattle still doeesn’t want you. Better services by going to Burien?!! Name one service that would be better. Burien would provide less cops, firemen, social services ect.. It might be a smaller city, but other than that you would not get more services. If you like going to more meetings and having higher property taxes… By all means. Just remember you’ll pay more for a fire chief and have less firemen. Small town politics at it’s best. We will have more police with Burien. Ever been to South Park? Almost no Seattle police coverage there. What social services does Seattle provide that we can not get elsewhere? Arguing over which city will provide more of which services, based on the present level of present services, is futile. The question should be: From which city will we have the better chance to get the services we need? There’s only one correct answer, and that answer is Burien. Both sections of North Highline combined would comprise FIFTY PERCENT of Burien. The north section of North Highline would amount to a scant FIVE percent of Seattle, roughly speaking. In Burien, you could vote yourselves the services that you need — if you organize. In Seattle, you will be last in line with your hands out, begging for crumbs while your tax money pays for cost overruns on the tunnel, services to downtown Seattle, and services to Seattle’s other neighborhoods. Under those circumstances, even if you organize, your voice will not be heard. It really is that simple, folks, and no pro-Seattle argument will change that basic math. When Burien puts annexation on your ballot in 2012, you should grab it. You’ll be glad you did. Seattle provides more cops, firemen and social services. Period. If you don’t believe me, look it up. You’ll be glad you did. @AJ: In what way does Seattle offer more “Fireman?” Yes, it is a large fire department. But that’s because Seattle is a large city. Are you referring to fire/ems responses. Both the Seattle Fire Department and King County Fire District 2 (the district that serves Burien, et al) are fine fire departments. Other than size, I believe they are both quite capable of puting water on the fire and handling EMS calls just fine. Seattle has a lot more of a lot of things. Does not mean White Center is ever going to see any of it. Seriously look at the history of South Park. Took them 100 years to get a library. What was once a vibrant neighborhood was destroyed by Seattle turning a blind eye to it. After much research and a few calls….these are what both Fire Departments offer as their first alarm response if your house is on fire. 4 Engines staffed with 4 people, 2 Ladder Trucks staffed with 4 people, 2 Battalion Chiefs, 1 Aid Car staffed with 2 people, 1 Medic Unit staffed with 2 people, 1 Air Unit with 1 person, 1 Staff Vehicle with 1 person, 1 Safety Chief, and 1 Deputy Chief. Big difference for Ivan,…you should do the math. Thats 13 vs 34 “Firefighters,” or whatever nomenclature you prefer “Burienite,” I don’t care…….as long as they put out the fire. Just remember, the firefighters do what they can with what they have. It’s not their fault if your paying overhead for 2 departments to do the work of 1. I just don’t think think in this case….smaller is better. Stick to arguments you can win. If your so sure Burien can provide more services than Seattle you should do some fact checking and post them…you might learn something. AJ thanks for the information. I’m surprised that people who adovcate so strongly for more say in government are also adovacating to take away a choice. Ivan were you fired as 34th District Democrat President? Why would you ever advocate NOT having a vote? If it’s uniformed as you portray people won’t vote for it, plain and simple. Give people a chance to educate themselves and vote. The best interests of a community are decided by it’s own citizens and business owners. As an informed citizen my own fact finding has found some basic facts. I encourage all citizens to become informed on your own. Don’t listen to Ivan, AJ, Liz, Burienite, Russ, JW or myself. Become informed on your own. At the minimum, don’t let anyone take away your vote!! Your facts were false when you posted them a year ago, and they have gotten no truer over time. Anyone can check those facts..
Aj, yep Seattle committs a HUGE amount of resources on a first-alarm residential or commercial fire resposne. They always have, and in doing so, they take a bit of a chance, as sending all those units to one call makes them unavailable to respond to other calls. In the case of West Seattle, sending all those units essentially drains their entire West Seattle Battalion (called Battalion-7). If there was a house fire on the Seattle side of Roxbury, they would have units from EVERY West Seattle Station except the Admiral station (Station 29) and a unit from the south Park Station (Station 26). Additionally, the ONLY medic unit in West Seattle would be dispatched as well, as part of the first alarm assignment. It is a massive response. Now, is this an appropriate use of all these resources? It is debateable, and some will argue both ways. I know that the surrounding fire agencies–like Burien and N. Highline–operate differently, but essentially have operational reciprocity and address major incidents as “one” department, crossing in/out of jurisdictional boundaries to assist on each others calls. So I think AJ is maybe not telling the whole story with how other departments outside of Seattle work. He makes it seem as if each separate department outside of Seattle is incapable of handling emergency responses. I don’t think that’s the case. His assertion is true with regards to Seattle’s staffing. They have four person engines and ladders. But wait one or two more years, and I predict their staffing will be reduced on some units, as Seattle’s budget continues to suffer (http://www.mynorthwest.com/?nid=11&sid=454393), and the mayor has asked all departments–including fire and police–to reduce their budgets by 3%. Staffing is less with neighboring departments, with North Highline staffing engines with three, and Burien staffing engines with 3 and 4 people. But again, if there is a major response, multiple units are sent to the call–just like Seattle. The only differnece is that Seattle sends to fully staffed ladder trucks, an air unit (for filling bottles), a whole host of chiefs (is that neccessary? ), and other support units. South King County agencies do the same thing, however it get’s done IF the fire is confirmed. Then the alarm is called a “working incident” and all those support units are assigned. This can happen immeditaely after the call is dispatched, it there is many 911 calls with good information, but not if there is only one call to 911. So in essence it’s is a philisophical difference in how to assign resources and when to do it. Yes, Seattle consistantly has higher staffing on their units, but at the end of the day, the fire goes out the same. Thank you for agreeing with me. Two points I have to correct you on though. 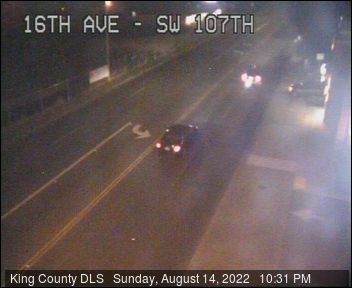 Can either Burien or North Highline (by themselves) immediately dispatch what their current first alarm response is? No, they can’t. They rely on each other because they can’t do it alone. That’s a fact. That is the whole truth and you need to be more honest with people reading this. It’s not their fault each department in essence fields 2 Engines. 13 vs. 34 firefighters is not a philosophical difference. Those are hard numbers. And while you may consider it debatable, having large amounts of staffing immediately is always good. If Burien and North Highline could do it….they would. I understand and even agree with the argument that we would be 50% of Burien vs. 5% of seattle. It’s a point worth pondering. and Property taxes vs. Burien. These are things that can be fact checked, and don’t make Burien look that good. It’s like looking at buying two houses, one is huge and one is small. Talk about the charm of the smaller one all you want, but don’t argue about which one has more square feet. That should be obvious. Stick to the charm argument. All your doing is making people notice the square feet. If you have three times the number of people, you need more chiefs. That much should be obvious…more workers…more supervisors. Fired? It’s a volunteer position. I was elected unopposed for two terms, served them, and did not run again. And please quit misrepresenting my position on the vote. I have stated many times in this forum that the LAW REQUIRES that there be a vote. And in fact, there will be one — in 2012 — in which North Highline voters will decide if they want to annex to Burien. You can expect Burien to decide that this year. It is up to each city council to decide whether to put annexation to a vote. Neither city is obligated to do this, no matter what the county might wish, no matter what the Growth Management Act says, and no matter what residents might wish. Once a city council decides to put annexation to a vote, then there is a vote. But the residents have no right to a vote until a city decides to move forward with an annexation ballot. The city has to do what’s in ITS best interests. Is that quite clear? According to the law, until either city decides to move forward, unincorporated you will remain. He’ s right George. There will be a vote… He just doesn’t want people to be able to vote on whether or not to join Seattle. Just Burien. It doesn’t matter though, I have it on good authority from Burienite, JW and Liz that Seattle is constructing a Death Star. Their going to use it to protect the neighborhoods of Magnolia and Queen Anne. It’s going to be housed in White Center and all the workers and associated slums will be located there too. As a public works project all taxes used to fund it will come from libraries. Here’s the worst part it’ s going to use the tears of kittens and puppies to power the laser beam. When will Seattle learn to stop forcing slums, taxes and Death Stars on the citizens of North Highline. I fear they will never learn. Oh well. In the meantime the citizens of Seattle will just have to make due with thier higher levels of police, fire and social services… and thier lower property taxes. Yes… this is meant as joke. Aj I can pull figures out of my rear end also. Your Death story is as about as factual as the rest of the things you have posted. Way to add to the debate JW. Just for the record, (excepting my last joking post) you know my facts are true. So you can snipe all you want, but just because you don’t like them, doesn’t make em false. Either contribute or debate. Just quite with the snide comments about South Park, they make you seem bitter and reactionary. Look, it’s OK to be pro-Seattle annexation and anti-Burien annexation, OK, but let’s not get ridiculous here. It’s up to the Seattle City Council — not you and not me, not any resident or residents in North Highline, and not the man in the moon — whether or not to put annexation on a North Highline ballot. It’s not that “I don’t want you to vote” on Seattle. That’s nuts. If they decide to put annexation on the ballot, the law says there will be a vote, OK? In my opinion, Seattle should not be doing this. Not only can Seattle NOT afford to annex at this time, but in my opinion, North Highline residents, if they were to vote to annex to Seattle, would soon find that THEY can’t afford SEATTLE. You might disagree with that, and that’s fine. But the Seattle City Council appears to have seen it my way, and that is not in dispute. As things stand now, there will NOT be any vote on annexing to Seattle until there is a vote on annexing to Burien. By all means, you should campaign for a no vote on Burien if that is your position, but (1) do not expect to prevail, and (2) remember that if a Burien annexation vote fails, that is no guarantee — no guarantee whatever — that there will ever be another vote to annex to Seattle. Burien is in the driver’s seat now, and it is my best guess that most North Highline residents will go along for the ride gladly, to get the uncertainty out of the way once and for all. I wish you, and some others I could name, lots of luck defending an obstructionist position, and chasing a pie in the sky pipe dream that might never be realized. North Highline will be a full, muscular partner in an up-and-coming Burien, and will have a major role in shaping that growing city’s destiny. It would always be a poor relation begging for crumbs at Seattle’s back door. As the campaign develops, that fact will become clearer and clearer, and more and more obvious. I look forward to watching you and others tie yourselves in knots trying to deny it. Thats a full and muscular argument you made Ivan…. You make some valid points. Points that I wish others would use as the centerpiece of their arguments. But lets not be ridiculous. Lets not use service levels as a basis for comparison if you want Burien to come out on top. Burien would lose, over and over again in that comparison. They lose in Fire, Police, Social Services and Taxes. Local control is debatable. There are plenty of other arguments to make. Make em. I look forward to others tying themselves in knots arguing those facts. I look forward to all those facts your going to pull out of your rear end. Haven’t seen any facts yet. Just your debatable opinions. Ivan, who gives you more more muscle in county, state and federal government, Seattle or Burien? I have not, at any time in any of these discussions, used service levels as a comparison. Whereas I don’t live in the affected area, I don’t think it’s my place to decide for residents what priorities they should put on any particular services, or what weight they should assign to one over another. Everybody’s needs are different. I base my argument solely on what I consider to be the overriding issue here: In which municipal government would North Highline residents have the most representational clout? As part of which city would residents be most able to control or manage their own destiny? The answer is Burien, and no amount of spinning and twisting can even rebut that fact, much less refute it. Any Burien City Council candidate, incumbent or challenger, who hoped to be elected or re-elected, would have to deliver the goods to a unified North Highline or risk defeat. That is not, and never could be, the case in Seattle. George’s question: “Who gives you more more muscle in county, state and federal government, Seattle or Burien?” is irrelevant. Under Mike McGinn, who has already alienated the Governor and the County Executive, Seattle’s muscle in the higher levels of government has diminished considerably. That question is valid only in the theoretical sense. As a practical matter it is meaningless. Certainly Burien, with northern North Highline added to it, would have more clout in the county than it has now, and its lobbyist in Olympia would be representing considerably more people than is the case now. Would you consider being part of a small city having more representation at the local level… Like having more voice at a service district meeting? North Highline Fire District represents a small area. By your argument people should have a HUGE voice. It got THEM an obscenely overpaid chief, almost no firefighters, and a district in financial ruin. If you want to throw stones you should check your own house first. Or I guess Vashon’s. Your argument stands for nothing with me. By the way… Everyones needs are different. (White Center might even need it’s police and fire more… Who knows?). But I’m pretty sure every one wants more services for less money. Is it different on Vashon? I figured you would say something along those lines Ivan. Absoultely discredits anything you say about representative government. I bet we aren’t. I’m sure a much more passive audience whom don’t challenge your chest beating is much more your style.